MOTT THE HOOPLE were considered by many to be the greatest live rock band England had ever produced. Founder members of MTH cut their teeth playing live with DOC THOMAS GROUP – MICK RALPHS, OVEREND WATTS and latterly DALE GRIFFIN all came together in Doc Thomas Group with one STAN TIPPENS on lead vocals (replaced by IAN HUNTER in MTH. Stan then became MTH Road manager). Much sought after this album was released in 1966 initially only in Italy. A bonus album recorded in 1990 from another of Watts/Griffin bands THE SILENCE is also included. Ralphs went on from MTH to form BAD COMPANY – enough said. 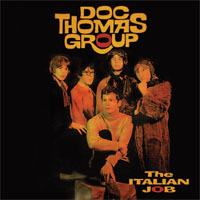 The Italian Job is a pleasant if unremarkable period piece...the bonus inclusion of Shotgun Eyes, an album recorded in 1990 by The Silence...is something else. Fifteen sizzling tracks of heart-racing proto-punk, machine-gun riffing and primal rock 'n' roll...may yet encourage a new generation to seek out and discover the whole story. If you feel like cutting the rug, this collection will do nicely; if you're up for expanding The Hoople horizons, this is essential. It's biting blues through and through and a living history lesson for everyone.